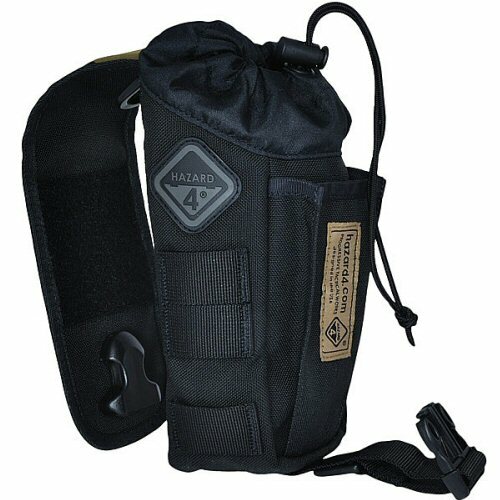 The Hazard 4 Flip-Pouch is a multi-pocket pouch for storing a small 1 litre water bottle or two rifle magazines. A pocket in the front can be used to hold an additional sachet of drinks powders or sterilisation tablets. The top of the pouch has an internal compression bag which closes with adjustable shock cord and toggle to help keep the top of drinks bottles clean and free from dust and dirt. The pouch lid is extra long to cover the front of the pouch entirely, or to offer additional length if the pouch is being used to store a longer or taller bottle. The lid closes with quick release buckle directly mounted onto the lid, and secured to the bottom of the pouch on an adjustable length strap. 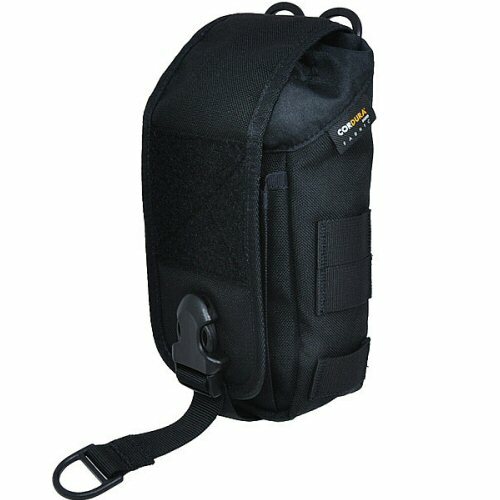 The sides of the pouch have three 25mm wide loops of Cordura webbing for attachment of side accessories or pouches. 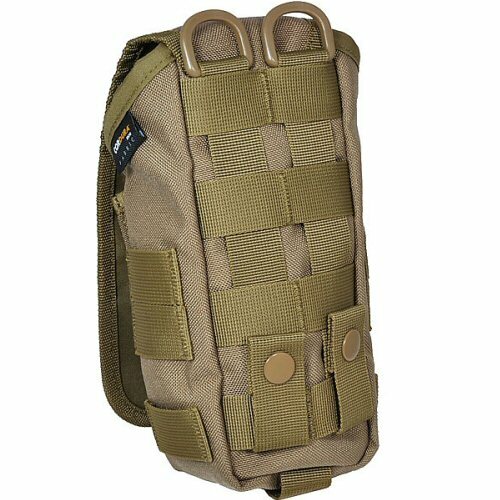 The bottom strap is fitted with a D-ring, as are the MOLLE loops on the rear. 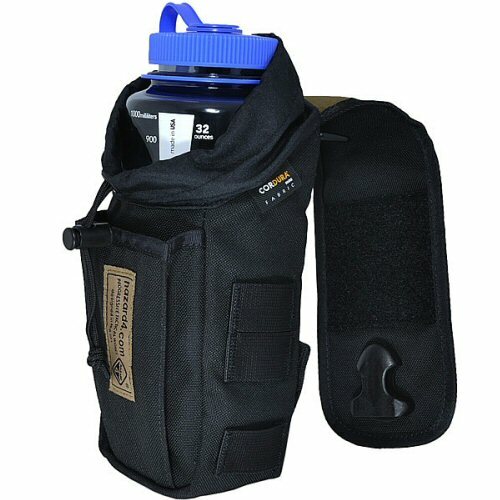 This allows the pouch to be additionally secured with lanyard or strap. An attractive polymer Hazard 4 patch is mounted on the right side of the pouch. Made from 1000D Cordura nylon. Accessories shown with the pouch are for illustration purposes only and are not included. Pouch colour is ATACS AU. 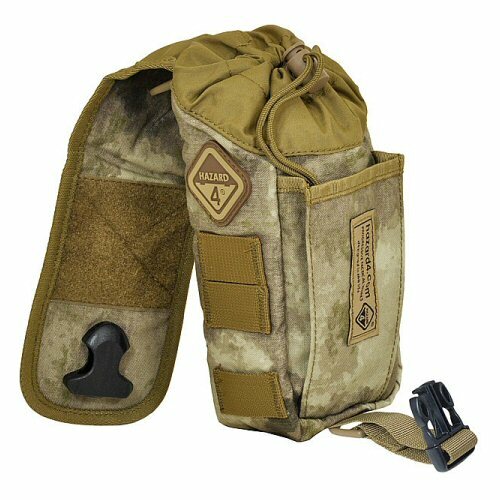 The right side of the pouch showing Hazard 4 branding and side MOLLE webbing. The rear of the pouch is MOLLE ready.